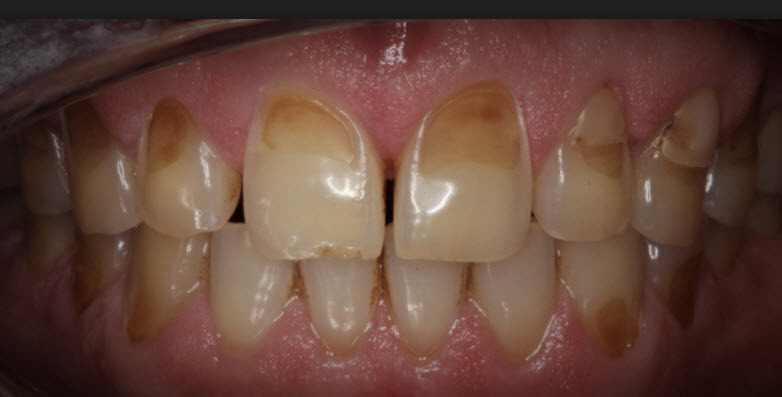 Tooth enamel erosion can be is caused due to coffee, tea, cola, and cigarettes staining the enamel on your teeth. Enamel is the thin outer covering of the tooth. This tough shell is the hardest tissue in the human body. Enamel covers the crown which is the part of the tooth that is visible outside of the gums. Because enamel is translucent, you can see light through it. But the main portion of the tooth, the dentin, is the part that’s responsible for your tooth color — whether it’s white, off white, grey, or yellow. Enamel helps protect your teeth from daily use such as chewing, biting, crunching, and grinding. Although enamel is a hard protector of teeth, it can also chip and crack. In addition, enamel also insulates your teeth from potentially painful temperatures and chemicals. Corrosion. This occurs chemically when acidic content hits the tooth surface such as with certain medications like aspirin or vitamin C tablets, highly acidic foods, and frequent vomiting from bulimia or alcoholism. More findings show bulimia as a cause of enamel erosion and tooth decay. Bulimia is an eating disorder that’s associated with binge eating and vomiting, and a source of acid. Frequent vomiting erodes tooth enamel and can lead to cavities. If the enamel loss is significant, the dentist may recommend covering the tooth with a crown or veneer. The crown will protect the tooth from further decay.